order from her recent trip to CHA. 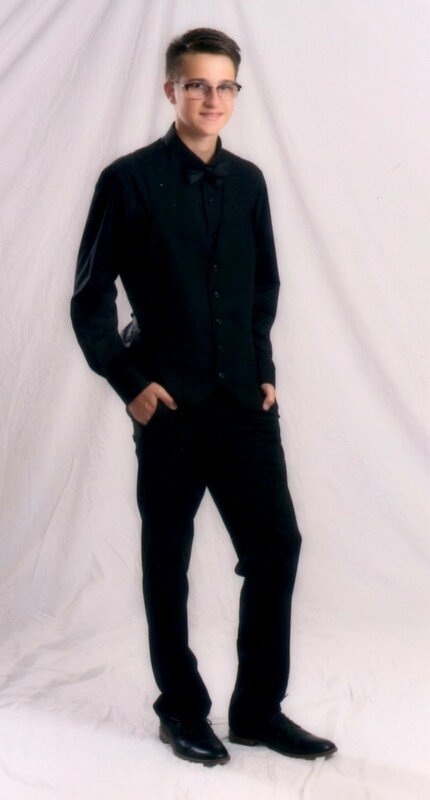 Note: you can click on any picture to get a close up look. Consists of three acrylic templates, a circle, a small oval and a large oval. without the insert, your paper is embossed completely, leaving the shape blank on your paper. When you use the shape insert alone with an embossing folder, just the shaped area is embossed. This is the first card, closed. I used the small oval template with the swiss dot embossing folder. Only the portion of the template with the oval hole is left unembossed. This is a tri fold card, so I could show you how each of the templates in the package work. On the second panel, I used the large oval template and a plaid Sizzix embossing folder. Only the cut out oval is left blank. On the third panel, I used a cuttlebug embossing folder with the circle template. 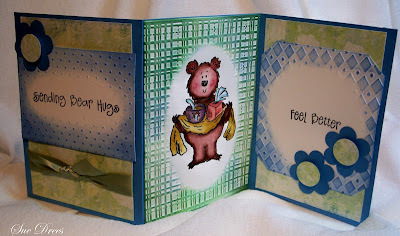 The stamp set used on this card is My Favorite Things, Fred Bear Gives Comfort. Paper is Annalee from Prima. 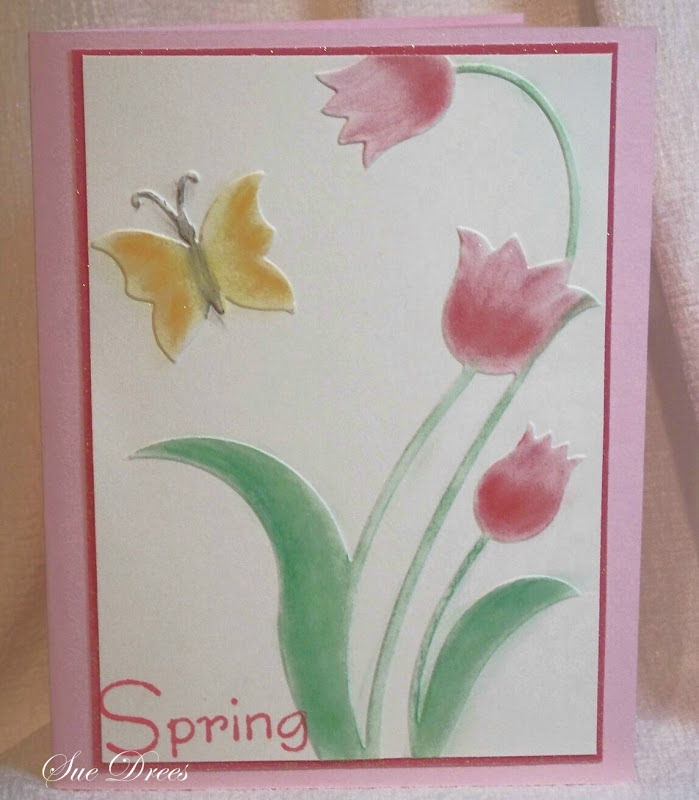 I used the Ranger sponge applicator to add Adirondack Ink, Meadow and Stonewashed to add color to the embossing. I colored with the new, Ranger Distress Markers, and used a Dove Blender to shade. 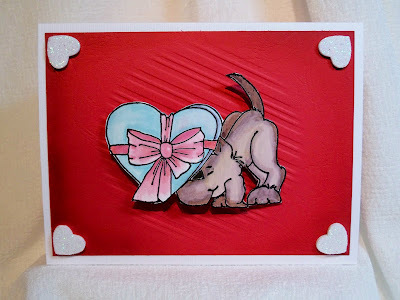 On this card, I used the circle cut out only, so that when you emboss using an embossing folder, only the circle is embossed. This is a Sizzix, stripped embossing folder. Stamp is from Inky Antics, B163. The inside sentiment is from Great Impressions. Colored with new Distress Markers pictured above, and used a Dove Blender to shade. 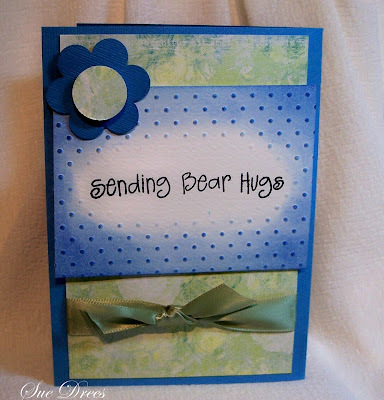 I used the small oval insert only with the Dotted Swiss embossing folder, so that only the oval is embossed. The butterfly is Stampendous, the inside sentiment is My Sentiments Exactly. Inside punched butterflies is EK Success Border punch. Colored with new Distress Markers and used the Dove Blender to shade. I used the large oval insert only when I embossed on the gold mirror paper. Only the large oval is embossed. 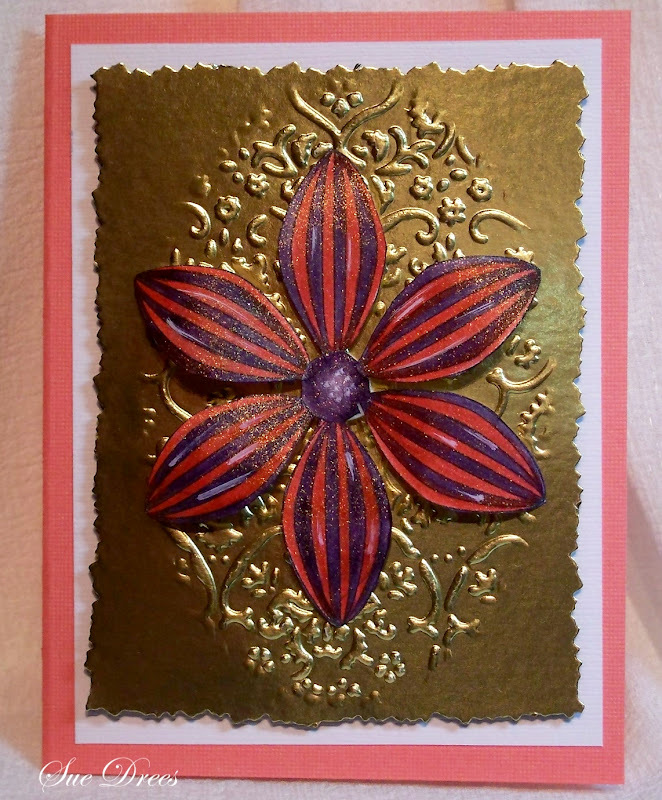 The flower is from Outlines Rubber Stamp Co. 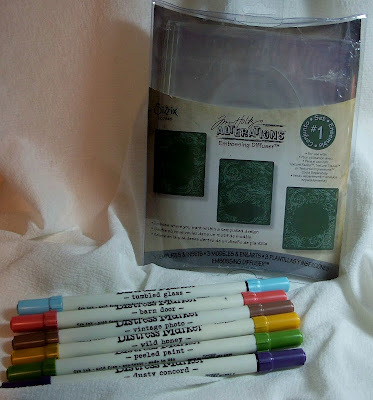 I colored with new Distress Markers from Ranger pictured above. Sprayed the flower with Perfect Pearls Gold and water from a mini mister. The inside sentiment is from Penny Black. These are fun to use and you can place the shape anywhere on your paper. So versatile. Thanks Krystie, for this information. 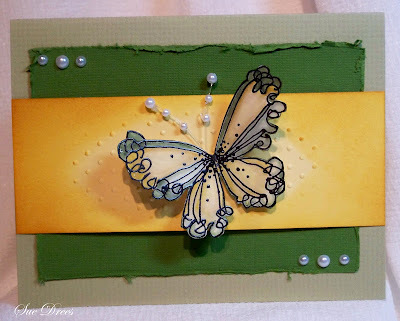 This one is from Crafts Concepts, called Sophia's Garden. Colored with shimmery chalks. Inside Sentiment is Hero Arts. Such a beautiful Spring design! Hope you enjoyed this little preview of some of the new things that will be showing up in the store. Check the blog on a regular basis, as Sharon is posting items as they come in. Oh wow those are great new tools and your cards with them are awesome Sue! I love your tri fold card and I am sure loving those arcylic templates! I love all of your cards using the new products. You did a great job showcasing them! what a lovely cards sue. Wow, so glad I stopped by and learned about the new tools. I love them. Thanks for sharing so beautifully.